Stemona tuberosa is well known for its use in Chinese traditional medicine, but it’s got a much more intriguing claim to fame: It’s one of less than a handful of plants known to science that engages in vespicochory—that is, it gets predatory wasps to disperse its seeds. It was a strange enough discovery that Gao Chen and his colleagues at the Chinese Academy of Sciences in Beijing wondered how the plants manage to convince the hornets to haul their offspring around. All it takes is the right scent, the team discovered: parts of the plant smell and taste like the insects the hornets normally hunt. Lots of plants convince wasp relatives—particularly ants—to move their young around. In fact, ant-mediated seed dispersal or mymecochory has evolved at least 100 times in flowering plants and is used by more than 11,000 species. And until Chen and his colleagues took a closer look, that’s how it was thought Stemona tuberosa seeds were dispersed, too. But when Chen and his colleagues decided to study the plant in greater detail, they saw wasps carrying away seeds instead. They soon realized the predators “pounce” on the protected seeds of the plant (called diaspores)—as “if they were trying to ‘kill’ them by biting, much like their behavior when attacking prey“. Once a wasp rips off a seed, it drags it quite far—an average of over 110 meters away. Often, the helpful hornet eventually stops to rip off most of a fleshy external part called the elasiosome—usually considered the bait for seed-dispersing ants—and takes it with them to their nest (presumably to feed their young). That leaves the diaspore with its seed behind, where ants can discover it and take it to their nests—putting the seeds exactly where they need to be to germinate. And this wasn’t a rare thing. In their 2017 study, hornets were the only animals that actually took diaspores from the plant and moved them around. They saw ants visit a couple of times, but they couldn’t tear anything off like their bigger cousins could. And that, combined with the relatively short distance the ants moved diaspores when they did find them—a little over a meter and a half on average—suggests their role in seed dispersion is secondary, and perhaps mostly helpful because they drag the seeds underground where they’re safe from seed predators. 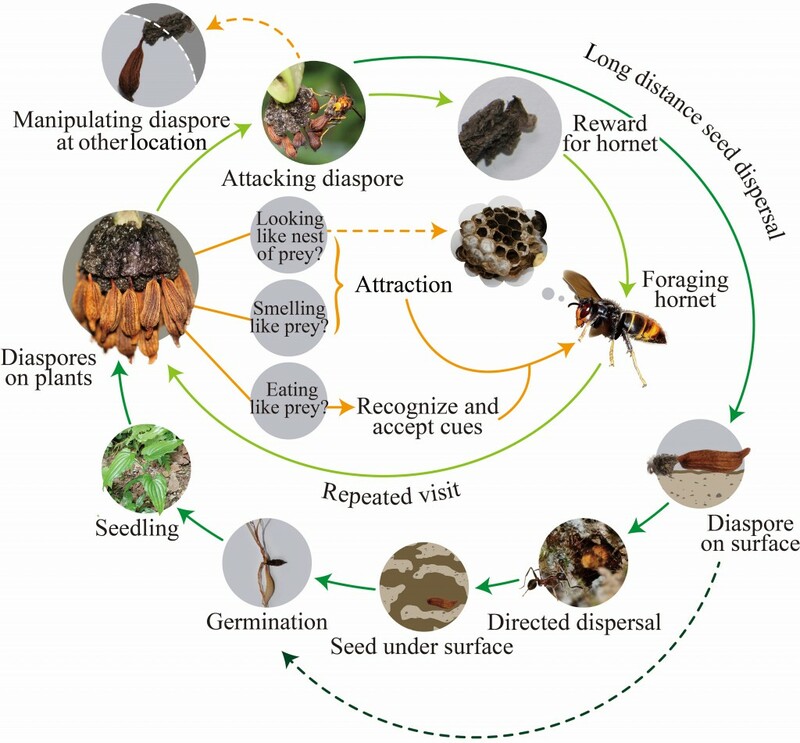 But all that doesn’t explain why the species of hornets seen acting as seed dispersers rip off and carry the seed capsules away in the first place. All are predatory species that feed their young other insects, not plant parts. So the research team decided to look a little closer at the fleshy elasiosomes the wasps seemed so interested in. The researchers collected Asian hornet nests (Vespa velutina) and used them in a series of choice experiments. First, they let them choose between whole diaspores, unprotected seeds, and just those fleshy elasiosomes. They also tagged hornets that attacked the seed capsules to more closely monitor their behavior. But to really look at what smells might be attracting the hornets, they took empty diaspore capsules and made them ‘odorless’ in the lab by stripping potential scents with dichloromethane. Then, they soaked the empty capsules in scent extracts from different parts of the plant and seeds. They also analyzed those scent extracts to determine what they were comprised of, and tested the wasps with synthetic versions. Their results were published this year in the journal New Phytologist. When offered whole diaspores, elasiosomes, or seeds, the wasps took no interest in the unprotected seeds—which makes sense, since they’re unable to break through the tough diaspore capsule anyway. But they readily attacked and carried off the whole capsule or just the fleshy bit—suggesting that meaty elasiosome really is the part they’re after. And that was confirmed in the scent choice experiments. The wasps were strongly attracted to Eau de Elasiosome, and in particular, the abundant hydrocarbons the researchers detected in it, like pentacosane, tentacosane, tetracosane, and tricosane. That’s interesting because these compounds aren’t thought to disperse far in the air, begging the question of what draws the wasps close enough to smell them to begin with. The team thinks the bunches of diaspores might look enough like the nest of prey like bees to entice the wasps, but that remains to be thoroughly examined. Then the team dug even deeper, looking at gene expression in the wasps, and found two chemical sensory genes—VvelCSP1 and VvelCSP2—which were highly expressed in their antennae. Further tests confirmed these proteins bind with the hydrocarbons in the elasiosome extracts, suggesting they’re used to detect the attractive smell. Previous studies had shown that proteins and other elasiosome components are similar to the “blood” (hemolymph) of ants, so the wasps likely smell the tasty hydrocarbons, take a bite, and believe they’ve found a nice insect meal for their young. 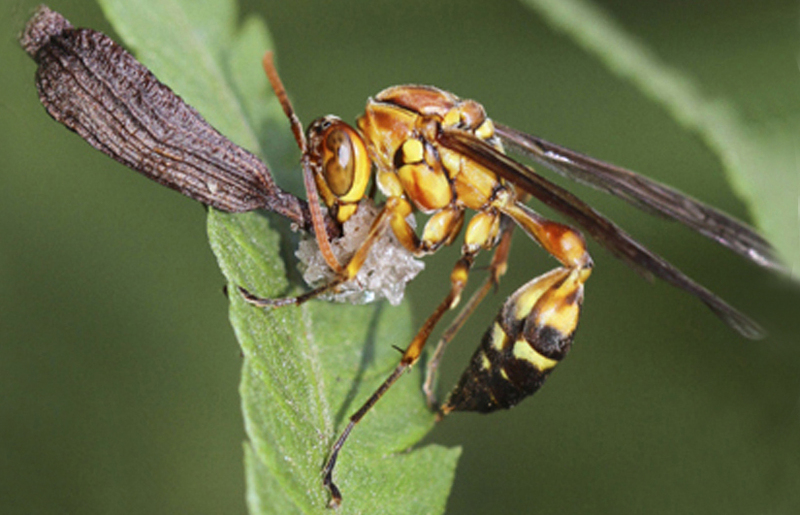 And their efforts aren’t unrewarded—Chen and his colleagues found that the elasiosome could actually be nutritious for the young wasps. So, while the plant does trick the wasps into thinking they’ve found a tasty insect, the ruse isn’t harmful—it’s a great example of mutualism. Since this fascinating win-win went undiscovered for so long despite the everyday use of Stemona tuberosa in traditional medicine, Chen and his colleagues think there may be a lot more plants out there that use wasps to disperse their seeds. And other work of theirs, which is as of yet unpublished, has found that several other plant families produce similar compounds that could be being used as lures. “We suggest that ‘smelling like prey’ may be not uncommon and may be an underestimated tactic in the dispersal of seeds in other mymecochorous plants,” they concluded. 附件链接>>>> Hydrocarbons mediate seed dispersal: a new mechanism of vespicochory.